Many of us associate lamb with a leg of lamb smothered in rosemary and thyme and served with a sweet mint sauce. A traditional Easter dinner that's often served for Sunday lunch in the United Kingdom, lamb doesn't appeal to some appetites because of its strong flavor. The good news is that other cuts of the delicious meat are available that are both milder and easier on the palate. Lamb shoulder is one of those. When slow-roasted for several hours, the meat melts in your mouth. 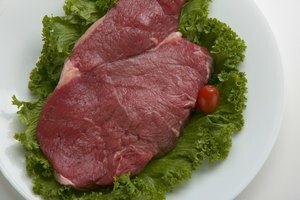 And cut into shoulder steaks and sauteed on the stovetop for just minutes, this reasonably priced protein may find its way onto your permanent grocery list! Lamb shoulder is one of the leaner cuts, which is why it lends itself so well to slow cooking. 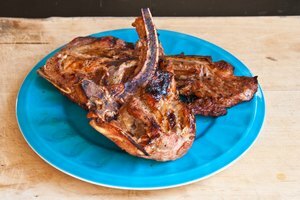 When cutting shoulder lamb chops, butchers avoid the thicker cut that you'll find in rib chops and cut them on the thinner side for faster searing, keeping them tender and flavorful. 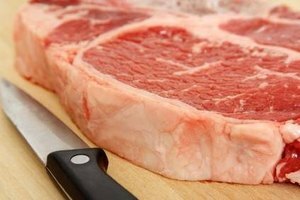 Unless you shop at a butcher who cuts to order, you're faced with choosing your meat from the grocery store's cold case where everything is packaged to dazzle. More than likely, you won't have a great selection of lamb steaks as demand is probably still at a moderate level. In fact, if desired, you may want to impress your butcher and ask when lamb delivery is expected and tell him you're in the market for lamb steaks cut from the shoulder. Most lamb steaks are cut from the shoulder, but some butchers will cut them from the leg. The meat from the leg, however, is stronger in taste and leaner because of the muscular composition. The leaner the meat, the slower it should be cooked for a tender finish. Lamb that is pale pink – with pink bones and fat that looks as if you could crumble it like feta cheese – is cut from young lambs. It's the most tender of all the lamb cuts. If it's darker in color, it's from an older lamb. 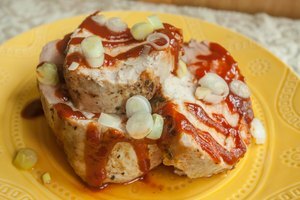 You want to avoid the dark red meat of mutton, which is very old lamb, as the meat is stronger. Oh well, let's leave that phrase alone for now and concentrate on preparing your lamb steaks for the skillet. Some initial prep is advised, and it'll probably take longer than the actual cooking. Bring your steaks to room temperature. Using your kitchen shears, make small slits in the meat around the curved sides. This allows the meat to expand without the steak curling up. Season with salt. Don't add pepper or garlic at this time as they burn when heated at a high temperature. In a flat-bottomed skillet, preferably cast iron, heat a teaspoon of olive oil, or good extra-virgin olive oil, until it starts to have a wavy appearance. Sear the chops on one side for 2 minutes, or until the skillet releases them without tearing the meat from the bottom of the pan. Flip the chops over and sear for 1 minute. Put the pan into the heated oven until an instant-read digital thermometer registers 145F for medium-rare. Carefully remove the pan from the oven using a thick potholder. The handle will be hot. Set the individual chops on a cutting board and scatter some finishing salt over the chops. Halen Mon or Maldon salts are good choices. Let them rest for a few minutes before serving. 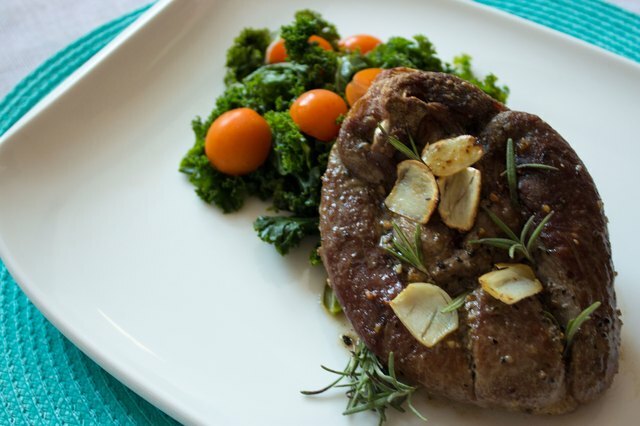 Strong herbs such as rosemary and thyme pair well with lamb steaks. If you're adventurous, drop some rosemary and thyme (use the full stalk – it has lots of flavor) into the skillet between the time you remove it from the stovetop and place it in the oven. Lift your lamb steaks and place them over the herbs for the final stages of cooking. The fragrance will penetrate your meat, and that hint of herbal essence lifts the meat to the taste of near nirvana. You can also make an emulsion from fresh mint by blending freshly chopped mint leaves with a tiny splash of cider vinegar and salt. A little boiling water will bring it all together. Sprinkle the mixture with a bit of salt and let it sit for about an hour before serving. How Long Does It Take to a Grill Pork Chop?